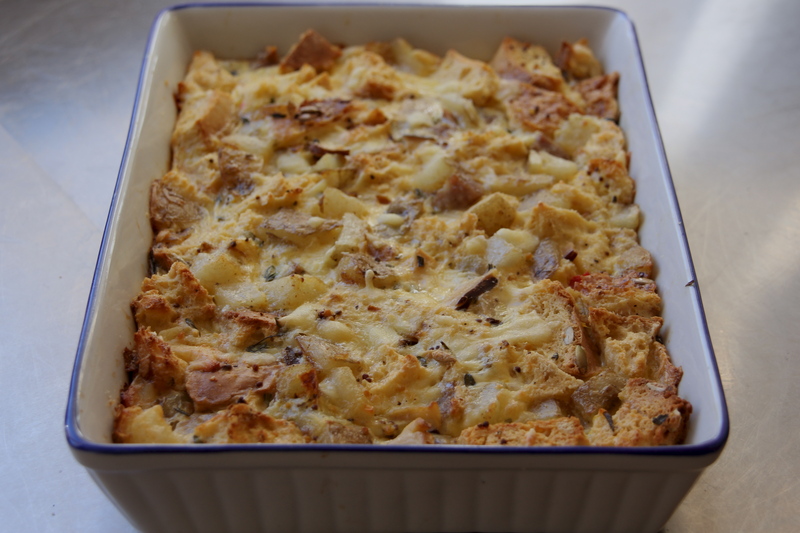 Bread puddings, often served as a sweet dish for dessert, also make for a great savoury side or a way to stretch a few eggs and a little bread to feed a crowd for brunch. And the leftovers are good cold the next morning too for a quick breakfast or simple lunch. This version uses a hearty combination of mushroom, sausage and potato. But there are lots of flavour pairings to experiment with. I have suggested some others below, so you can use the basic bread and egg base, and then add whatever mixture you like best. Roughly cut or tear stale bread into 3×3 cm (1 inch) cubes. You can collect up random bits of bread from different loaves, cube them, and keep in the freezer until you are ready to make a pudding. I include the crusts, especially when they have tasty sunflower or pumpkin seeds on them that will add flavour and texture. Spread your stale bread in an 11”x7” pan (or similar size pan that holds approximately 6 cups). If your bread is not nice and dry (quite stale), give it a quick toast under the oven broiler. Drier bread will better absorb the egg. In a bowl, whisk eggs, milk, thyme, mustard, salt and pepper. To cook your sausage, you can pan fry or grill it. Once cooked, cut into ½ cm (1/4 inch) slices, and then cut in half again horizontally. To cook the potato, wash and then cut into thumbnail-sized pieces. Place into a pot of salted water. Being to a boil and cook until the blade of a knife slides easily into the center. You want the potato to be cooked, but still hold its shape. Drain potatoes and let rest for a few minutes so that excess water dries off. Heat oil in a pan. Add potato pieces. Fry, turning occasionally, until they have lightly golden and crispy outside. Add rehydrated mushrooms, sausage, and potato to the bread cubes, spreading around to evenly distribute in the baking dish. Sprinkle in the Parmesan cheese. Pour egg mixture over baking dish to cover all the yummy contents. Give it all a gentle stir to make sure all the bread is moistened by the egg. You can sprinkle a little extra cheese over the top for a toasted cheesy crust. Bake in the oven for 35-40 min until egg is set.